Does Texas issue concealed carry permits? Texas is a Shall Issue State, and issues Concealed Handgun Licenses to residents of Texas and non-residents. Once your application has been processed, you must schedule fingerprinting at an IdentoGO center. Non-residents must also provide a proficiency certificate (TR 100) which you receive on completion of a handgun proficiency course approved by the department and taught by a certified instructor. For new licenses, the certificate must have been issued within two years. For renewal licenses, the certificate must have been issued within six months. Non-residents also have to provide a color copy of your state issued identification or drivers license (Front and Back). Texas’ concealed handgun licenses law went into effect in 1995 which made them a Shall Issue state. Who issues Texas Concealed Handgun Licenses? Texas Concealed Handgun Licenses are issued by the Texas Department of Public Safety. You can visit their Concealed Handgun Licensing website here. Are background checks required for a Texas Concealed Handgun License? Yes. For Texas residents, the Texas Department of Public Safety will conduct a criminal history record check through their computerized criminal history system as well as possible additional searches of local official records. For non-resident applicants, the Texas Department of Public Safety will conduct a search through the National Instant Criminal Background Check System (NICS). Does having a Texas Concealed Handgun License exempt you from the background check when purchasing a firearm Texas? Yes. Having a Texas Handgun License does exempt you from a National Instant Criminal System (NICS) check when purchasing a firearm according to the ATF Permanent Brady Permit Chart. There is a checkbox on the 4473 form that the FFL can check that states no NICS is required. How long is a Texas Concealed Handgun License valid for? Initial Texas Concealed Handgun Licenses expire on the first birthday of the applicant occurring after the fourth anniversary of the date it was issued. A renewal license expires on the birthday of the applicant fives years after the date of expiration of the previous license. A duplicate or modified license expires on the date the license that was duplicated would have expired. What is the processing time for a Texas Concealed Handgun License? The processing time for new Texas Concealed Handgun Licenses is within 60-180 days from the date they receive your application. How much does a Texas Concealed Handgun License cost? The fee for an initial Texas Concealed Handgun License is $140. Renewal licenses cost $70. What are the requirements for a Texas Concealed Handgun License? is at least 21 years of age; or at least 18 if you are a member or veteran of the US Armed Forces, Reserves or National Guard or was discharged under honorable conditions. How do I renew my Texas Concealed Handgun License and what is the cost? To renew your Texas Concealed Handgun License you must first complete a handgun proficiency course within 6 months preceding the date of application renewal for the first or second renewal and the date of application for renewal or the date of application for the preceding renewal, for a third or subsequent renewal, to ensure that the license holder is not required to complete the course more than once in any 10-year period. The cost of renewal licenses is $70. 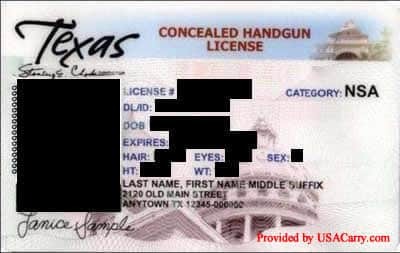 How do you change a name or address on a Texas Concealed Handgun License? What do you do if your Texas Concealed Handgun License is lost, stolen or damaged? If I get arrested or convicted, do I have to notify the Texas Department of Justice about the arrest or conviction? is arrested for an offense involving family violence or an offense under Section 42.072, Penal Code, and is the subject of an order for emergency protection issued under Article 17.292, Code of Criminal Procedure. If your license is suspended, you will get a notice in the mail about the suspension. You must then surrender the license within ten days of receiving the notice unless it has already been surrendered or seized as evidence, or request a hearing from the department. If I move my permanent residence to another state, is my Texas Concealed Handgun License still valid? From what we can tell, you are allowed to keep your Texas Concealed Handgun License if you move out of state as long as you submit a change of address to them within 30 days of the move. See details about how to change your address above. Can I transfer another state’s concealed carry permit or license to Texas? Texas does not allow you to transfer another state’s concealed carry permit or license to Texas. You must apply for a new Texas Concealed Handgun License. Does Texas accept any other state's concealed carry permits or licenses? Texas does recognize permits from other states. To see the most up-to-date reciprocity information, please view our concealed carry reciprocity maps. Yes. If a license holder is carrying a handgun on or about the license holder’s person when a magistrate or a peace officer demands that the license holder display identification, the license holder shall display both the license holder’s driver’s license or identification certificate issued by the department and the license holder’s handgun license. Does Texas issue Texas Concealed Handgun License to resident aliens with a green card? It seems that yes, Resident Aliens can apply for a Texas Concealed Handgun License. In the form Notice – Non-Immigrant – Visa they list the required documents that need to be submitted along with the application if the applicant is born out of the country. What are the laws for carrying a firearm in an automobile in Texas? Anyone traveling in Texas can carry a loaded handgun in their vehicle but it must be concealed, and the person cannot be engaged in criminal activity. Loaded long guns may be carried anywhere in the vehicle. What places are off-limits when carrying a concealed weapon in Texas? §46.02, Texas Penal Code and §46.03, Texas Penal Code also specifically prohibit handguns or weapons under other circumstances and from other locations other than those listed above. For example: It is against Texas law to carry a concealed handgun if the person has the handgun in plain view; or if the person is engaged in a criminal activity (other than a Class C traffic offense); or if prohibited from possessing a firearm, or is a member of a criminal street gang. Some other areas where weapons are prohibited include the premises of polling places on the day of an election or during early voting, the premises of any government court, the premises of a racetrack, in a secured area of an airport or within 1,000 feet of premises designated as a place of execution on the day a sentence of death is set to be imposed. Does Texas have a Stand Your Ground Law AKA Castle Doctrine Law? (1) if the actor would be justified in using force against the other under Section 9.31; and (2) when and to the degree the actor reasonably believes the deadly force is immediately necessary: (A) to protect the actor against the other’s use or attempted use of unlawful deadly force; or (B) to prevent the other’s imminent commission of aggravated kidnapping, murder, sexual assault, aggravated sexual assault, robbery, or aggravated robbery. (b) The actor’s belief under Subsection (a)(2) that the deadly force was immediately necessary as described by that subdivision is presumed to be reasonable if the actor: (1) knew or had reason to believe that the person against whom the deadly force was used: (A) unlawfully and with force entered, or was attempting to enter unlawfully and with force, the actor’s occupied habitation, vehicle, or place of business or employment; (B) unlawfully and with force removed, or was attempting to remove unlawfully and with force, the actor from the actor’s habitation, vehicle, or place of business or employment; or (C) was committing or attempting to commit an offense described by Subsection (a)(2)(B); (2) did not provoke the person against whom the force was used; and (3) was not otherwise engaged in criminal activity, other than a Class C misdemeanor that is a violation of a law or ordinance regulating traffic at the time the force was used. (c) A person who has a right to be present at the location where the deadly force is used, who has not provoked the person against whom the deadly force is used, and who is not engaged in criminal activity at the time the deadly force is used is not required to retreat before using deadly force as described by this section. (d) For purposes of Subsection (a)(2), in determining whether an actor described by Subsection (c) reasonably believed that the use of deadly force was necessary, a finder of fact may not consider whether the actor failed to retreat. What are the laws involving alcohol and carrying a concealed weapon in Texas? You must not consume alcoholic liquor, beer, or wine while carrying a concealed weapon. Texas Penal Code §46.035 states it is unlawful for an individual who is intoxicated to carry a concealed handgun. The Penal Code defines “intoxicated” as not having the normal use of mental or physical faculties by reason of the introduction of alcohol, a controlled substance, a drug, a dangerous drug, a combination of two or more of those substances, or any other substance in the body. If you have a concealed handgun license, you may not carry in a place of business that derives 51% or more of its income from the sale or service of alcoholic beverages for on-premises consumption. USA Carry always recommends never to carry a firearm while drinking alcohol. Does Texas have laws for No Gun signs? Yes, No Gun signs have the force of law. Private property owners may exclude license holders from carrying concealed handguns on their property by providing notice as provided in Section 30.06, Texas Penal Code. If you wish to prohibit license holders from carrying concealed handguns on your property, §30.06, Texas Penal Code requires you to post specific signage. The sign must be in both English and Spanish, must include the specific language described by law, must appear in contrasting colors with block letters at least one inch in height and be displayed in a conspicuous manner clearly visible to the public. Does my military training exempt me from the eight-hour training course for a Texas Concealed Handgun License? Auxiliary Service or reserve unit of one of the branches listed above. Are you allowed to carry concealed in Texas State Parks, State & National Forests, Wildlife Management Areas, and/or Road Side Rest Areas? What are the Texas Open Carry laws? Please visit our Texas Open Carry page for more information. 10/10/2018 – Information and links checked. 6/4/2018 – Broken links fixed. 9/23/2015 – Format updated along with all information. We try to keep the information on this page as up to date as possible, but due to changing laws it is your responsibility to verify all information. The information on this page is for informational purposes only and not to provide legal advice. You should contact your attorney to obtain advice concerning any particular issue or problem. Use of and access to this Website, emails or any of the links contained within the site do not create an attorney-client relationship between i156 LLC and the user or browser. The opinions expressed at or through this site are the opinions of the individual author and may not reflect the opinions of i156 LLC.